[O]wing to well-founded fear of being persecuted for reasons of race, religion, nationality, membership of a particular social group or political opinion, is outside the country of his nationality and is unable or, owing to such fear, is unwilling to avail himself of the protection of that country. In 1994, the San Jose Declaration reiterated the importance of the Cartagena Declaration, and broadened its scope to extend protection to the internally displaced. Mexico's law concerning refugees and asylum was not drafted until 2009. It was passed by Mexico's senate and the legislature's lower chamber in 2010, and signed into law on December 26, 2011. Mexico's law, written with technical support from the Office of the United Nations High Commissioner for Refugees (UNHCR), incorporates the broader definition of "refugee" found in the Cartagena Declaration. Thus, Mexico's Law on Refugees, Complementary Protection, and Political Asylum grants protection for people whose lives have been threatened by generalized violence but would not be considered refugees under the 1951 Convention. It also considers gender as grounds for persecution, incorporates the principle of non-refoulement, and includes provisions regarding non-discrimination. Moreover, if an individual does not qualify for refugee status under this extended definition, the Ministry of the Interior may grant complementary protection, which halts the return of an individual to a territory of another county where his or her life would be in danger of being subjected to torture or other cruel, inhuman, or degrading treatment or punishment. All foreigners in national territory have the right to apply for refugee status, which must be submitted to COMAR or the National Institute for Migration, within in 30 days after entering national territory. The procedure lasts 45 business days, a period in which confidentiality, non-discrimination, and non-refoulment to the country of origin or habitual residence where their life, security, or freedom is threatened are guaranteed. Likewise, the right to a hearing is guaranteed and at the end of said period, COMAR will issue a reasoned and motivated resolution regarding the recognition or not of refugee status as well as the granting of complementary protection. As part of the procedure, the applicant must fill, in his/her handwriting in front of an authority, an information form in which he/she must provide personal data and the reasons for which he/she emigrated from his country of origin or habitual residence. Applicants for recognition of refugee status have the right to legal representation. When interviewed, the applicant must narrate the events that led to his/her departure from his/her country of origin or habitual residence, as well as provide evidence to support his/her statements. If required, assistance is provided by a translator or interpreter of his/her native language or understanding. Throughout the process for recognition of refugee status, respect for human rights of the applicants and refugees is guaranteed. Upon being granted the recognition of refugee status by COMAR, the right to access permanent residence is obtained. It should be noted that, according to Mexico's law, any immigration proceedings initiated due to illegal entry are suspended until a final decision regarding an individual's refugee status is submitted. Statistics from COMAR, as seen in Figure 1, show that the number of people seeking refugee status in Mexico has been increasing over the past couple of years. 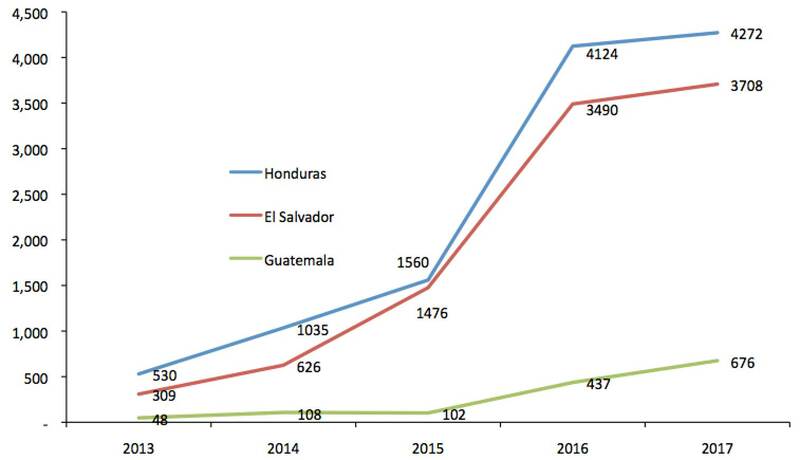 More specifically, the number of asylum applications coming from the Northern Triangle countries (Guatemala, Honduras, and El Salvador) has seen an increase. These three countries provide the majority of applications received by COMAR. Cuba and Venezuela have also been significant contributors. As application numbers increase, Mexico has also granted international protection (asylum and complementary protection as defined in Article 13 and Article 28 of Mexico's Law on Refugees, Complementary Protection, and Political Asylum) at an increasing rate, to individuals who complete the application process. 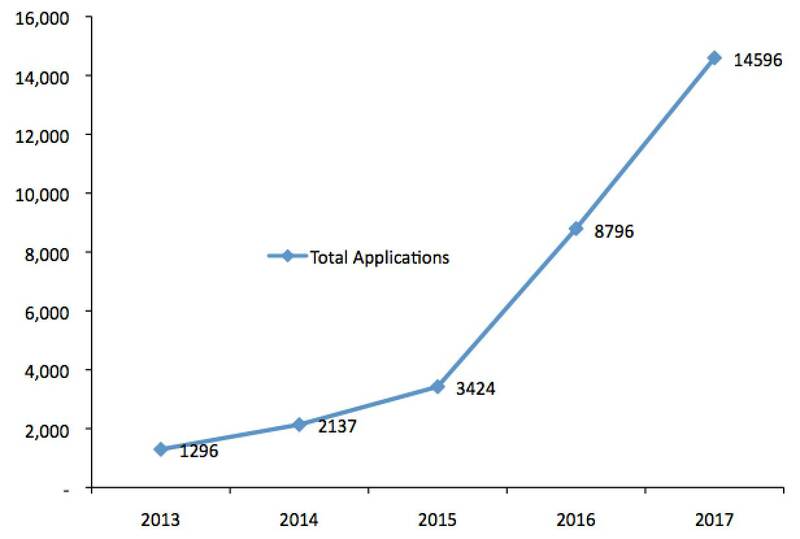 It should be noted that many abandon the application process, and are not included in the data shown in Figure 3. Given the increase in asylum applications, COMAR has experienced a backlog. Once resolved, the applications that are currently still in the review process could impact the international protection provision rates. It remains to be seen if the number of applications received by COMAR will continue to rise and if the rate of recognition will follow the upward trend seen over the past couple of years.